After a fast and furious summer Mr Ambel is feeling the heat of his self imposed deadline. Lots of recording action this summer including more tracks for the follow up to Los Dudes self titled record, more recording for Chris Berardo & the DesBerardos and a hard hitting single from Austin band the Ghost Wolves. The new Del-Lords record titled “Elvis Club” is mixed and mastered and awaiting a release date from GB Music. Jimbo Mathus‘ “White Buffalo” is also done and set to be released on Fat Possum Records at the beginning of the year. Ambel will be attending the Americana Music Festival in Nashville, TN. Performing with Jimbo Mathus & The Tri-State Coalition on Friday at the Mercy Lounge at 8pm and also speaking on the Producer Panel on Friday at 2pm. Keep an eye on the ‘gigs page’ for gig info. Also, check out Eric Ambel on Brooklyn Country Radio. Hour long podcast with interview and solo acoustic performance. Actually, the dog did not eat my homework, more like a saying my Grandmother used to say that would baffle us all: “I’ve been busier than a cranberry merchant”. We never knew what that meant. So, here’s the latest. Tracking and mixing is completed for Jimbo Mathus and the Tri-State Coalition’s upcoming release titled “White Buffalo”. This was a blast and had myself and engineer Mario Viele flying down the birthplace of Othar Turner in Como, Mississippi for the last sessions ever at Jimbo’s Delta Recording Service. The stuff was brought back to Cowboy Technical in Brooklyn where it was mixed by Tim Hatfield, Mario and I with Jimbo in attendance. Jimbo was also on hand for the Last Call show at the Lakeside Lounge on April 30th. After 16 years we shut the doors but not with out a fine send off from a lot of friends, staff and musicians. Jim Marchese’s great photos are up in a gallery on the Photos page. You can also read a pre-show write up in the NY Times and also the Times’ play by play of the show. 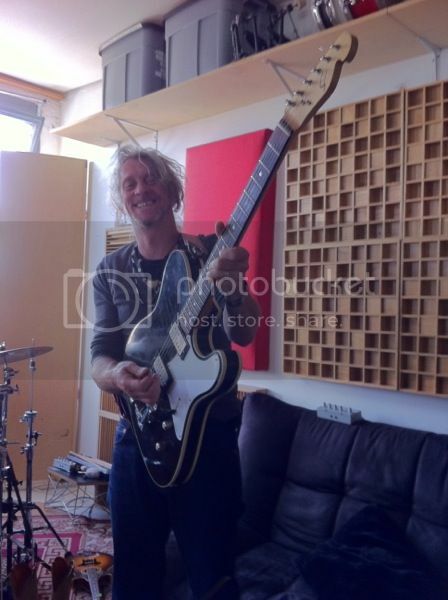 Jimbo Mathus with the Stonetree Roscoe Deluxe Sr.
Tracking is underway on Karen Hudson’s “Sonic Bloom” record. We hope to get the second half of tracks recorded soon. Also been working on songs for Nate Schwebber’s still untitled solo record. Nate is trying to finish all the angry songs before he gets married next month. Good friend Marshall Crenshaw was also at CTS to have Roscoe, Timbo & Mario mix his song “I Don’t See You Laughing Now” for his upcoming subscription series of 10″ vinyl EP’s and it was mighty good fun. Ambel also played and produced on tracks for the upcoming record from Chris Berardo & the DesBerardos and just returned from a week in Texas gigging with the band in a lot of cool and hot places. During this period of obvious slacking Ambel got Los Dudes back in the studio working on the follow up to their self titled debut. Many gigs were played also but Los Dudes is another band wondering where to go after the closing of the Lakeside. Also, a little while back I produced a record by a cool band called Maynard & The Musties from my new neighborhood of Clinton Hill, Brooklyn. The record is called “Cheap Cigar” and there are ways to obtain said record. One way is to head to their band camp site http://maynardandthemusties.bandcamp.com/ Go get it! You are gonna like it! Also, the Del-Lords record is getting closer and closer to completion! You can cruise over to the Top Ten Blog to read all about the latests developments. On top of all this I found my way to Louisiana to play some gigs with Jimbo and also many other achievements which I promptly ejected from my personal hard drive. I hope you’ll have the time to check out some of this very cool music. After 16 years on Avenue B my partner Jim Marshall and I are shutting down the Lakeside Lounge. You can read about it in the NY Times and also on the Lakeside’s website. Please join us for the last night April 30.